In my last post I dissected the Squidoo FAQ to squeeze out every bit of official information about lensrank. There’s another possible source of official lensrank information right under our noses: the Squidoo Dashboard. I submit, ladies and gentlemen of the jury, that Squidoo is not expending great gobs of computing and hosting power calculating and storing lens stats for our sole benefit. Most of these stats measure factors alluded to in the FAQ. 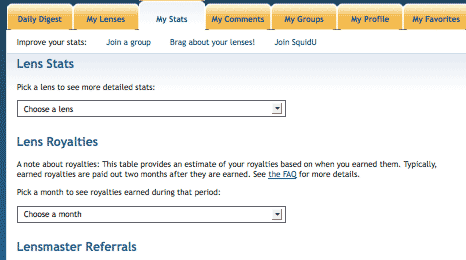 I suspect that most if not all of our Squidoo Dashboard stats are lensrank factors. We don’t know which carry the most weight, and the lensrank algorithm changes from time to time, but dashboard stats tell us a lot about what Squidoo, at least, thinks is important for an effective webpage. So let’s dig deeper and see what the Squidoo Dashboard has to tell us. Squidoo is always pushing us to make more lenses. The Giant Squid program (mentioned below this header) is one way they push, and you’ll see others if you read the Squid Blog. It’s not hard to guess why: every lens is another tentacle for catching web traffic, another source of SEO-worthy links to other parts of Squidoo, and another source of ad revenue. The message is: Get WIPs featured; fine-tune them later. Traffic is the second thing mentioned— not just any traffic, but seven day traffic. Which means, if you’re lazy and pragmatic like I am, you may not want to do much social bookmarking when you first publish a lens. You’ve already got the “brand new lens” freshness boost, so just draw a little traffic to it via Twitter, an announcement in SquidU forum, pinging with SquidUtils, activating the Discovery Tool, and your signature. Optimize for search engines and do enough to get indexed, but don’t worry about capturing every traffic source at launch. Instead, save most social promotion for when lensrank starts to drop. Each social promotion method may produce a flurry of new visitors. If one seems to be working, hold off a few days before pulling the trigger on the next. Earnings (commissions from Squidoo modules that “sell stuff”) are mentioned as lensrank factors on the FAQ. Based on personal experience, I’d say they’re one of the biggest factors. I’ve seen my most dramatic lensrank jumps from sales. Caveat: That may be due to the fact that I don’t target or get many sales on my “selling stuff” modules. People often think the “biggest lensrank factor” is the one they’ve under-utilized in the past, because “new” sources of lensrank boost can cause a big jump. And on the third hand, I think lensrank factors are strongly weighted by the following rule of thumb: if it helps Squidoo grow and prosper, chances are, it will be rewarded by Squidoo! Pending Comments may simply be a useful reminder for us. But the last thing the FAQ mentioned as a lensrank factor was “curated” lenses. Perhaps one indication of “curated” is not how many comments we get, but when we last attended to them, or maybe how often. I certainly saw a huge lensrank jump when I came back from a several-month hiatus and cleared out my comments queue, although that may have been because I edited all those lenses. It would take carefully-controlled testing to determine whether comment moderating actually impacts lensrank and how. I simply raise the possibility. Below my screencap, four blocks on the page focus on two stats: the top and least trafficked lenses, and the freshest and most stale. Traffic, freshness, and number of lenses get emphasized again and again. I would not be surprised if the top four lensrank factors were: recent traffic, time since last update, pending earnings, and clickthroughs, with frequency of updates factored in separately. Finally, there’s a reminder about the Giant Squid program (even if you’re a giant Squid). This reminds us that number of lenses (also mentioned at the top) counts— but only after the Giant Squid quality control program makes sure you don’t have buckets of junk lenses. So, once you’ve passed a human screening, “lots of lenses” gives your lenses a lensrank boost. Making the Giants 100 Club earns an additional “lots of lenses” boost. Therefore: make lots of lenses, but make sure they’re good, then apply for Giant Squid-dom. So much for Daily Digest. 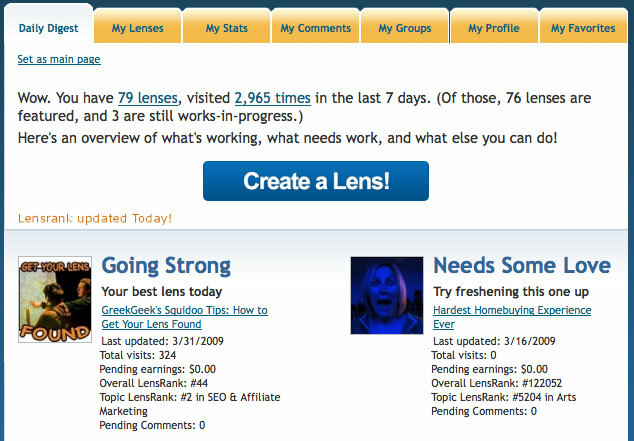 Turning to the Lenses tab where most of us do our stats obsessing, we get: Rank, Rating, Visits, $$$, Edited. The FAQ mentions “community ratings” first, and they’re the first thing on the dashboard. Number of stars may not be very significant; I suspect the “number of stars” count is a legacy of early Squidoo, when they hoped people would be more selective about rating lenses from 0 to 5 instead of 0, 1 OR 5! However, I note that on individual lens stats, number of ratings is also recorded. As as I mentioned in the last post, there are a lot of clues that Squidoo hunts for and will suspend people found manipulating ratings. That tells me that “community ratings” are still very important, even if the exact number of stars may no longer count for much. So if you want to boost lensrank, add a friendly reminder to visitors to rate your lens. I’m skipping over Visits because we obsess over traffic too much, except to remind confused newbies that it’s a 7-day summary of your most recent traffic, not a cumulative count of all past and recent traffic. $$$ again reminds us that whether we earn through third party affiliate marketing or don’t care about money, Squidoo’s got to consider the bottom line. Boost your lensrank by pointing your visitors to intriguing Amazon or other e-commerce modules and using personal recommendation to make the sale. Edited pushes us to keep “curating” our lenses. The FAQ has said frequency of updates is important, and we have also got a lot of evidence that time elapsed since last update is important. I’ve heard but not confirmed that there are “lensrank drops” at certain fixed intervals, e.g. 30 days since last update, 60 days since last update. Remember you can click the top of a column to sort lenses by that statistic. That makes it easy to find and update stale lenses. Individual Lens Stats. We’ll examine these in more depth in the next section. Earnings. The bottom line. Bookkeeping between us and Squidoo for our records and theirs. Could historical earnings data for lenses have any bearing on current lensrank? Maybe not; Squidoo has to record this stuff for other reasons. Referrals. On the one hand, referrals from a lens may give it a small lensrank boost. On the other hand, in two years and dozens of referrals, I’ve yet to see any referral translate into earnings (I’ve heard a similar complaint from a lensmaster with hundreds of referrals). You would be the apple of Squidoo’s eye and stand to gain bonus money if you could figure out why so few referrals translate into actual earning and contributing lensmasters (most never make a single lens). You might check referrals’ bios from time to time and give encouragement to them, although I confess I’ve only done that once or twice (and then found most had not filled in profiles or contact info). Last but by no means least, each lens has three pages of individual lens Stats. But this post is getting so long I’m going to break it into 3 parts. Okay? Okay. Stay tuned for Squidoo Dashboard Secrets Continued. Great information here! I hope you have made a lens with this info, too! This is super! Subscribing right this minute! I’m not sure how to fit all this info on to a lens! Glad it’s useful. Excellent reminders and tips. I am going to write about this post today on Squidlog. This is a great post and answers many of the questions I have just been asking as a relative newbie. I think it’s important that newbies be educated with the proper protocol for lensrank and how to properly rate a lens. It’s evident from the comments in SL, the forum, etc. there is a fair amount of confusion on the subject. Thanks again for this detailed and informative blog. This is a great way of looking at lensrank – and the dashboard. I find it interesting that so few referred lensmasters go on to contribute, as you say. It makes me wonder where all the successful lensmasters are coming from. Perhaps most people who go on to take Squidoo seriously are the ones that favorite it for closer inspection later, or do plenty of research before clicking the “Join Now” link. I didn’t join Squidoo for more than a year after hearing about it. By then I had lost track of the original lens that had introduced me. Check-In Jan 2015: Where Is Greekgeek? A WordPress theme by Ravi Varma. Mosaic from Jo Edkin's Make a Mosaic.